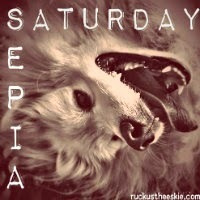 Ruckus the Eskie: Sepia Saturday #120: What's in Bowl Numero 1? We're waiting to hear! What's the tasty treat? Ruckus looks like something might jump up from that bowl. Ruckus, where are you? Is everything okay? Everyone healthy and well? Maybe just a bad Internet connection?